Cologne – 1. 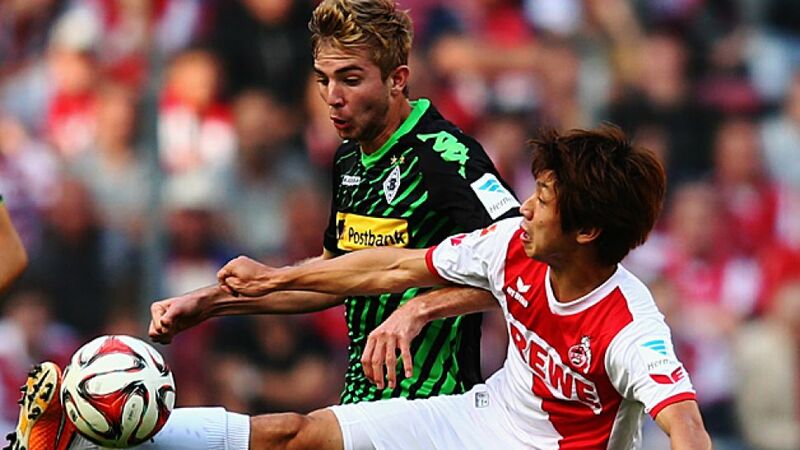 FC Köln and Borussia Mönchengladbach maintained their unbeaten starts to the Bundesliga season after playing out a 0-0 draw in the 81st Rhineland derby at the RheinEnergieStadion. Both sides missed opportunies to claim all three points, with Köln’s Pawel Olkowski thwarted by Yann Sommer and Max Kruse heading wide at the start of the second half, but a draw was a fair reflection of an evenly-balanced contest in North Rhine-Westphalia. Unsurprisingly, Köln coach Peter Stöger opted for the same back four that had kept a clean sheet in each of the hosts’ three Bundesliga matches prior to Matchday 4, but that defence was almost breached inside the first ten minutes when Foals defender Tony Jantschke headed Andre Hahn’s corner into the arms of Timo Horn. Kruse volleyed wide from a promising position moments later as the visitors looked to stamp their authority on the game. Gladbach had keeper Yann Sommer to thank for keeping the score at 0-0, though, when the Swiss international managed to get his fingertips to Olkowski’s goal-bound effort with a quarter of an hour gone. Lucien Favre’s side continued to have the better of the chances, however, with Kruse and Granit Xhaka both trying – and failing – to trouble Horn from distance. Hahn perhaps should have silenced the vociferous home crowd when he latched onto Kruse’s cut-back with ten minutes of the half remaining, but the 24-year-old failed to hit the target. Raffael, who opened his personal tally for the season against FC Schalke 04 last weekend, then managed to barge his way through the home rearguard, only for Kevin Wimmer to get a boot in before the Brazilian could get his shot away. Kruse squandered an even better chance to break the deadlock with the second half just two minutes old, heading inches wide of Horn’s left-hand post from Hahn’s inch-perfect cross. Raffael then failed to pick out Oscar Wendt, who would have had a clear sight of goal had the attacker managed to threat his pass through the Köln defence. Borussia were nearly made to rue their profligacy with the hour-mark approaching, Köln striker Ujah coming within inches of connecting with a teasing left-wing cross, before Sommer played the ball straight to the feet of the Nigerian, whose weak attempt from the edge of the penalty area spared the goalkeeper’s blushes. A half-chance it may have been, but the 23-year-old’s effort appeared to spark the hosts, and indeed their fans, into life once more. Olkowski saw a long-range piledriver fly just over the crossbar, before substitute Simon Zoller shot straight at Sommer. Neither side managed to fashion a breakthrough in the closing stages, however, as the hosts remain the only top-flight team yet to concede this season.